Performance management information systems and geographic information systems are powerful tools for assessing, mapping, managing, and reporting performance and spending information. MEASURE-BiH for USAID/BiH developed a web-based performance information management system (BIHPERFORM) that allows entry, storage, aggregation, retrieval, display, and reporting of USAID/BiH project and activity performance indicators and information on interventions’ work types and spending. The system has an administrative function that allows USAID/BiH staff to assign user roles and administer projects and activities. Moreover, it streamlines the submission and review of reporting by USAID/BiH implementing partners. BIHPERFORM is fully integrated with GIS mapping application developed by MEASURE-BiH to enable users to store, visualize, and analyze spatial information about USAID interventions throughout BiH. Mapping interventions in geographic area can help USAID/BiH to further synergies in programming and prepare evaluation sampling plans. 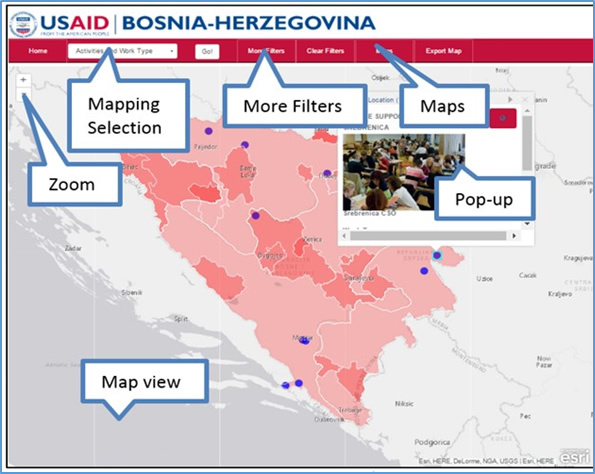 Using the interactive mapping application, information about USAID/BiH interventions can also be displayed in conjunction with the secondary data stored by MEASURE-BiH in the geodatabase (e.g. land cover, economic indicators, and election results). This linkage allows users to examine the location and performance of USAID/BiH interventions in relation to social, economic, political, and environmental considerations.